Chapter 6: Suffrage Jerk – Tell my story. For 17 years, my husband and I owned and lived in a 98-year old row house in Washington, D.C. about 10 blocks from the U.S. Capitol. We loved our neighborhood — the Victorian (and older) row houses had history and character despite the fact the neighborhood was sketchy, the front yards were handkerchief-sized, the closets tiny, and parking impossible. What was great was living in and around history, so to speak — those who helped build the city and our nation lived in our neighborhood once upon a time, and you could see the U.S. Capitol dome from my house (true, you had to stand on the roof to see it, but still, there it was). One of my favorite places in the neighborhood was the oldest house on the Hill, the Sewall-Belmont House (now a museum of women’s suffrage and equal rights). I walked by the house every day when I worked at an association on Capitol Hill. As I passed the Belmont House in the mornings, I would sometimes think about the story my mother told me about my great grandmother Rosa LeBarte Countryman — how her support of women’s voting rights embarrassed my great grandfather, Richard Sr. I wondered what it was that made Richard Sr. uncomfortable — several relatives used to say how Richard Sr. was a strong-minded guy; stubborn on occasion, but someone who did what he wanted when he wanted. Surely he appreciated a strong-minded spouse, as Rosa seemed to be. Maybe it was that Richard Sr. preferred to have only one strong-minded person in the family at a time. My great grandfather, Richard H. Countryman Sr. Family photo. Maybe Richard Sr. may have realized that if Rosa somehow gained voting rights, she’d feel empowered to enforce those rights around the house, to balance the scales of family justice. To make Richard Sr. iron his own damn shirts. Or to make Richard Sr. quit seeing Protestant women he met at prayer meetings on the side. In a nutshell, Richard Sr. couldn’t shut Rosa up, so he did the next best thing, Mom said. She didn’t tell me outright; I had to do some creative fishing to discover what it was, and when I did, I got pissed off. I later reckoned it was a waste of energy to be pissed off about this family story all the time, so I decided to get busy. So, for much of my adult life, I’ve tried to uncover Rosa’s story from anyone and anywhere. I would spend months at a time digging around in family files, reading old newspaper clips in both bound and microfilm versions — and even questioning my reluctant, stonewalling aunt for what seemed the millionth time — to find out if there was anything to confirm Mom’s story. After exhausting all known family records, I visited the Southern Cultural Heritage Center several times (which used to be my old elementary school — and Rosa’s school — St. Francis Xavier Academy) and found some information about Rosa when she was a student and soldalist, but not much more than that. The staff at the Center were helpful and friendly; but they didn’t have a large budget, so hardly any records were scanned when I visited. I was very careful, but tense as I handled the fragile old attendance books, careful not to damage any of the tan, brittle pages. In 2013, I came to the conclusion that I couldn’t find anything concrete tying her to the Mississippi suffrage movement. Family anecdotes could not stand up as proof, and, based on other contemporary information about Rosa (from census data, city directories, school records), it was unlikely she was prominent in the movement: In 1914, Rosa was a 32-year-old mother of four children (ages 12, 10, 5 and 1); Richard Sr. was a foreman at the Cumberland Telephone & Telegraph Company, as well as a part-time itinerant Baptist preacher building a congregation on weekends. Richard Sr. was likely gone more often than he was home, and I seriously doubt Rosa would have left a baby and young children to lobby for suffrage, even though she may have supported it strongly. Of course, just because I couldn’t find information that Rosa was a corset-burner doesn’t mean she didn’t work behind the scenes in some way to support the cause — after all, she was intelligent, well-read, a good writer, and active in the community. Despite the personal disappointment, I’d collected a fair amount of information about Mississippi women in the suffrage movement. I decided to put together an outline and draft an article anyway. I often do my best work in the middle of the night, when everyone else is asleep. One evening, I was at home going through the Library of Congress database and found an archive of photographs online and other resources on the March 3, 1913 women’s march. In addition to the contemporary accounts of the parade, I wanted to look at paraded itself; to see what the women were wearing, to see the crowds, and so forth, to best describe them in my article. It was an intriguing series of photos: Throngs of women — many of whom traveled hundreds of miles to walk down crowded, muddy, slush-encrusted Pennsylvania Avenue on a cold, brisk March morning, one day ahead of Woodrow Wilson’s inaugural parade — their banners, their expressions, their energy clearly captured in crisp black-and-white. The series of photos captured the energy of the event, as the marchers fought the cold reception from the men as well as the biting, brisk cold air that whipped the women along on the parade route. Those women were uncomfortable, all, but they would persist. This handsome man’s photo inserted in the queue. It struck me, not only because it seemed out of place. 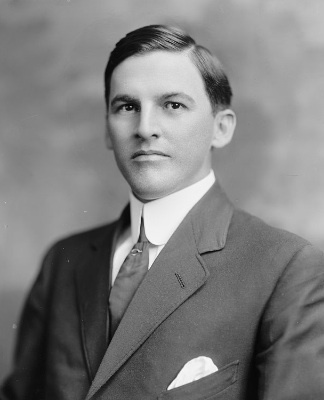 Perhaps he was an early champion of suffrage, I thought — I checked the name: “Honorable Emmett Wilson.” I made a note, and continued to go through the photos. Two days later, I was reading through transcripts of the National American Women’s Suffrage Association (NAWSA) meetings of February and March 1914 in Washington, to hear their issues debated in the Senate and House of Representatives. Even though Rosa wasn’t there, I know she — and other Mississippi suffrage sympathizers — must have read the newspaper accounts of the upcoming meeting with Wilson’s staff with hopeful expectations! As I settled into my chair, with a hot cup of Earl Grey tea, I started reading. Actually, I forgot about the tea as I was caught up in the minutes, and realizing what was going on. It was profound, really — all these white men in a large room debating whether or not women were ‘able’ to cast a vote responsibly, on the basis of their mere gender. It dawned that this took place less than 100 years ago — and that I really take a lot for granted, living as I do in the 21st century. I remember thinking, “these assholes surely aren’t interrupting their fellow congressmen,” as I looked up the names in the Congressional Database and read about Keating and Wilson’s careers as U.S. Congressmen. “Aha. Wilson,” I remembered Emmett of the handsome visage right away, and looked through my notes. But before I turned off my computer for the night, I looked back at the photos — at Emmett’s specifically. There was something about it — and about him that bothered me. I didn’t know this guy at all, I wasn’t remotely interested in learning more about this guy. Just like that. Simply. Plainly. Out of nowhere. — but I heard it AGAIN. Clearly. I felt my skin crawl — like something else was in the room. I’m not superstitious, nor do I believe in ghosts, but I swear, it was as if Emmett was there, asking me. What could it hurt to find out about this guy while I’m doing the suffrage story? I said to myself. Maybe there’s something to it. So, that night, I decided I’d figure out who this Emmett person was, and perhaps it will be enough to put a little story together, so I could put this ghost or whatever out of my mind — it couldn’t be too time consuming. And here we are, six years later. What a story it has been. And a journey. And a blessing. There’s so much to tell you, which I will over the next several months as Emmett’s story unfolded, left me awestruck, amazed, saddened, and grateful. Emmett was many things, including a suffrage jerk, when it was to his benefit. But there is so much more to the story of this one obscure man, and I can’t wait to tell it. I think the truth was that Rosa was mostly a private person despite her strong opinions, and was more comfortable in a behind-the-scenes role. If she was involved in suffrage, it would have been secretly, quietly, maybe writing articles under a pseudonym, or doing the necessary research to help the movement, and the like. Small gestures towards a larger goal are still important, worthy things. I also think the truth was that Rosa and Richard Sr.’s marriage was often troubled. If it was, my grandmother would never have said anything about it. She adored her father, but Richard Sr. was no saint, despite his religious calling. It turns out that my great-grandfather had girlfriends on the side while he was out and about, saving souls and all that — and — this was one of the catalysts that drove Richard Sr. to have Rosa institutionalized at the Mississippi State Hospital in Meridian. But there was a catch: In Mississippi, one couldn’t just lock up one spouse in the insane asylum to trade in on another; there was a 10-year wait. So, Richard Sr. waited, along with the girlfriend. And…almost exactly 10 years to the date my great-grandfather divorce came through, and he was all set to marry again, Richard Sr. dropped dead of a heart attack.